Old Testament - 2 Samuel 4 verse 11 stood out as David said this to the 2 murderers of Ishbosheth - "Now what reward should I give the wicked men who have killed an innocent man in his own house and on his own bed? Should I not also demand your very lives?" Similar to the Amalekite who claimed to have killed Saul and reported this news to David, David was not happy with the news. This all reminds me of the old adage that you cannot fight evil with evil - you'll get corrupted in the process. These 2 guys murdered an innocent man, thinking they were doing a greater good for David. David disagreed. Are there times in our lives where we do something wrong / bad / lie / evil for what we think might be a greater good? Aren't we then corrupted in the process? In 2 Samuel 5 David is anointed King of Israel. Pretty amazing that he reigned for 40 years total. Israel and Judah are now united - but they will be divided again only a short 75 years later. Verse 7 is the first time the term Zion is used in the Bible - "But David captured the fortress of Zion, now called the City of David" Below is a visual of Jerusalem at about this time that David conquered it from the Jebusites - and to the right the map shows the growth of Jerusalem just 50 years later in Solomon's time. (1000 B.C. to 950 B.C.) We'll come back to this visual when we get to Solomon in our readings. 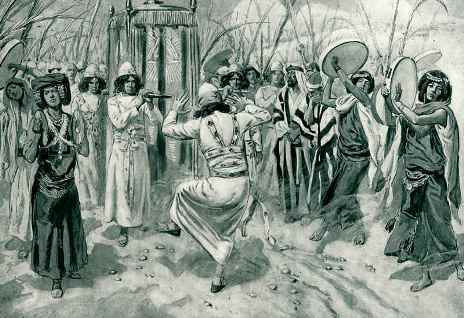 In 2 Samuel 6 when the Ark is brought back to Jerusalem verse 14 is phenomenal to imagine - "And David danced before the LORD with all his might, wearing a priestly tunic." And David's words in verse 21 are something for you and I to consider in our lives today - "So I am willing to act like a fool in order to show my joy in the LORD." Are you willing to act like a food to show your joy in God? Have you ever danced before God with all your might? Think you ever could? New Testament - I love the dialogue today between Thomas and Jesus in John 14 verses 4 & 5 & 6. Somehow I didn't quite remember the context of Thomas' question setting up Jesus' profound statement in verse 6. Beautiful. Jesus starts us off in verse 4 - "And you know where I am going and how to get there."" "No, we don't know, Lord," Thomas said. "We haven't any idea where you are going, so how can we know the way?" Jesus told him, "I am the way, the truth, and the life. No one can come to the Father except through me." These last two sentences of Jesus' we've probably all heard many times. But how often have we asked Thomas' question either to ourselves or to God or to now one in particular - "how can I know the way?" Jesus answers this for us perfectly. Do you believe that Jesus is the way, the truth, and the life? Verses 12 through 14 today are so convicting for me - because I really rarely follow this teaching (or fully believe in it?) of Jesus' - "The truth is, anyone who believes in me will do the same works I have done, and even greater works, because I am going to be with the Father. You can ask for anything in my name, and I will do it, because the work of the Son brings glory to the Father. Yes, ask anything in my name, and I will do it!" Do you believe that you can do the same works Jesus has done, and even greater works? I'll confess - I'm not so sure that I do. I mean, it's encouraging to think that I could, even if I don't fully believe it. And, yet, I believe most everything else Jesus teaches. Why would I doubt this teaching? Maybe it's because I have some sort of inferiority complex - or maybe I think it would be prideful to think this. But Jesus teaches it quite plainly. Or... maybe... I haven't really asked Jesus for the guidance and wisdom to believe this - and asked for even just this in his name. Psalms - Wow. Psalm 119 verse 29 is powerful - "Keep me from lying to myself; give me the privilege of knowing your law." Do you ever lie to yourself? If you answered no, are you lying to yourself now? :) I think lying to ourself is part of our human condition. I think we're all probably pretty good at it. And I think that maybe the cure for this is even found in this same verse - the prayer of "give me the privilege of knowing your law." It is a privilege to know God's Word. It is a free privilege, but a privilege none the less that we should not take for granted. And, through our study of God's Word let us pray that we allow God to show us any area of our life where we might be lying to ourselves. And let us allow God to redeem that area and give us the clarity of Truth. Proverbs - Proverbs 15 verse 32 I think is one great reason for us to be in community with others - "If you reject criticism, you only harm yourself; but if you listen to correction, you grow in understanding." I think if we are not in community with others, we can avoid criticism. Which is just as good as rejecting criticism. But, if we are truly in community with others - and yes, community can and should be messy really - then we will inevitably be criticized at some point and in some way by those around us in community. But this is a very good thing! We need to listen to correction from those around us. We need to grow in understanding. Are you in community? A community that will actually constructively criticize you from time to time? And will you listen to this criticism so that you might grow in understanding? I have so enjoyed reading the Bible every day. I have never taken such an awesome undertaking before. I feel that the Lord is working in my life as I do this. I applied this term for a Nursing School in town. I did not have faith in God to know that he was leading me in the right way. I have been chosen as an alternate. That is such awesome thing that God did for me. Out of 250 people that applied I was able to get on the list only by believing in God. This year has given me such a boost in my faith. Brian - thank you for this post! I am glad the One Year Bible has been a blessing for you this year. It has been a blessing for me too - and many others. I am glad you are on the journey with us. Congrats on making the Nursing School alternate list!